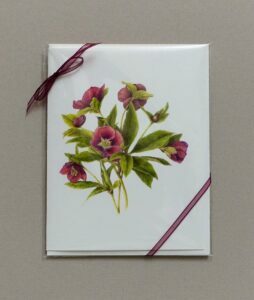 The Spring equinox (otherwise known as the first day of Spring) is today, March 20 and finds us with Perennial Flowering Stationery: Lenten Rose Botanical Note Card. Apparently, the Lenten Rose only blooms during the Lenten season! Within my post, I’m including an excerpt from Birds & Blooms magazine about the Lenten Rose. Some of my Pen Pals really love gardening! Looking at the perennial flowering plant Lenten Rose reminds me of a buttercup plant. Last week was the first time to learn of their existence and getting to see one. It was at a Lenten Lunch being presented as a Thank you to the guest Speaker. Just “up the road” (about 350 miles from here near the beach) is Brevard, North Carolina in the mountains. 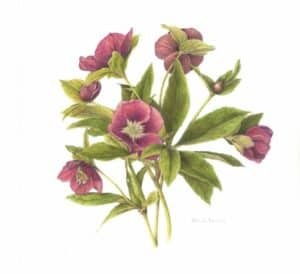 The Etsy Shop BarbeyBotanicals Botanical Fine Art Prints and Cards include free shipping to the US for their Lenten Rose Botanical Note Card for $3.75 each and measures 4.25 inches x 5.5 inches. “This beautiful card showcases a print of my original colored pencil illustration. It depicts a Hellebore plant, also known as Lenten Rose, that is in my garden. On the back of the card you will find a little story about the inspiration for the illustration. If you are a gardening enthusiast (or like the rest of us who think about gardening!) the below from Birds & Blooms is helpful information. As we wrap up, I’m continuing to strive to write Lenten Letters daily expressing my gratitude. 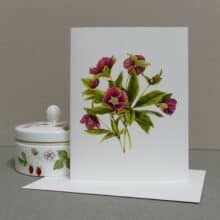 The note card we are seeing today is just perfect and I’m looking forward to placing my order and its arrival! If the discovery of the Lenten Rose is new for you as well, I hope you’ll consider adding one to your garden! P.S. The AnchoredScraps daily blog post countdown to 1500 continues with today being #1484!